Third Act Prelude to "Lohengrin"
Siegfried's Death & Funeral Music from "Götterdämmerung"
This is the fourth or fifth form this music has taken. Written for the Oscar-winning film Crouching Tiger, Hidden Dragon (2000), the soundtrack of which was released as a Grammy-winning CD, it was reworked as a Concerto for Cello and Chamber Orchestra by the composer and conducted by Tan Dun with Yo-Yo Ma and the London Sinfonietta on 28 September 2000. Tan Dun made it into an Erdu Concerto and he conducted that version 19 October 2001, with Karen Hwa-Chee Han as soloist, at the University of California Irvine's Barclay Theatre. The version under discussion here is Tan Dun's latest revision of the work; I am told it has been shortened from the previous versions, and it now runs about eighteen minutes. Early performances of both the cello and Erhu versions included projection of scenes from the film; this time the music was allowed simply to speak for itself, and it did that very well. The three movements' titles echoed the film, however: "Crouching Tiger, Hidden Dragon"; "Eternal Vow," "Farewell." Scoring, in addition to the solo instrument, was for strings, harp; flute and piccolo (one player); and percussion. Both the arrangement and playing of the percussion instruments was interesting. Behind the strings, in a line from right to left, was a bass drum, then four timpani spread out in a line with one player for each, and then a pair of bongos, played and sounding like a snare drum, to the left of all these. The timpani were also played with snare-drum type sticks – and hands – and frequently struck on the edge of the drum, with interesting results. The rhythms, particularly from the bongos, were characteristically East-Asian, and particularly brilliant in one passage. Less prominent were a tambourine, tam-tam, and cymbals played with bows. The flute/piccolo player, who was excellent, sat behind the conductor, hidden from where I sat. The harp, played normally, added to the sonority of the middle movement. The Erhu has two strings, played with a lengthy bow, has a wide range, from very high to quite low, and is capable of glissandi, as was heard at one point that I noticed. The music played on it – brilliantly in this case – was in a Chinese style. 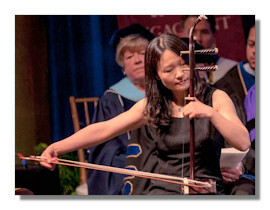 Jing Wang was born in China, and is a professor at the University of Massachusetts Dartmouth, where she teaches composition, music theory and electroacoustic music. A composer as well as a performer and teacher, she has had her compositions performed in nine countries: China, Australia, Russia, Turkey, Romania, Italy, France, Spain and the United States. On this occasion her performance earned a standing ovation and she played one encore. It is to be hoped that the Tan Dun Ehru Concerto will be recorded. It is an exciting piece, with some spectacular moments. The Sheboygan Symphony Orchestra is a civic ensemble with a surprisingly long history – this is its 96th season – and has a strong audience-following locally. The hall was full and there were a number of small – and well-behaved – children present. The playing was excellent in the concerto, as it has been in other works with visiting soloists over the years. There were some passing intonation and ensemble problems in the Wagner Third Act Prelude to Lohengrin and Siegfried's Death and Funeral music from Götterdämmerung which opened the program. After the intermission Brahms' Second Symphony was given an intense interpretation by McMahon, to the satisfaction of an appreciative audience.